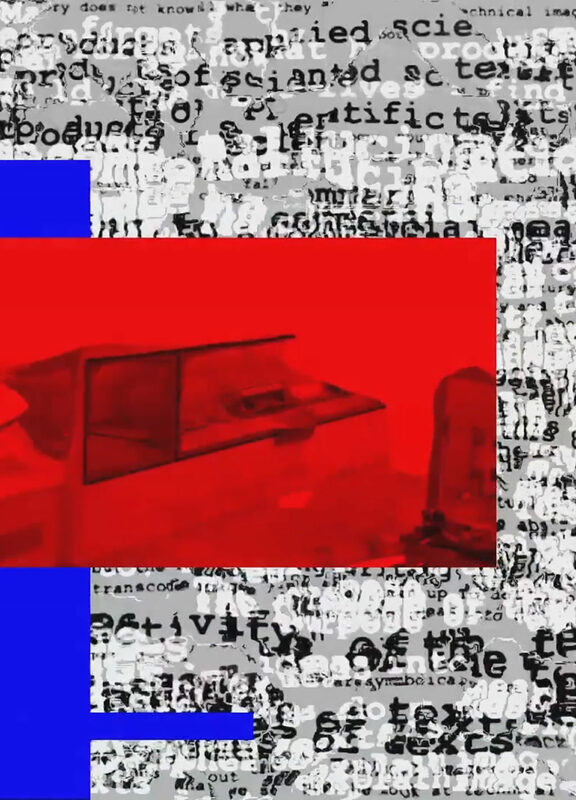 In this ten-minute video, an algorithm orchestrates in a pseudo-random manner the arrangement of different moving image blocks, confronting portions of text that are also in motion. The resulting visual proliferation, nourished by a soundtrack tormented by disembodied voices and a sort of industrial buzzing, seems to indicate the difficulty with which text and image have to coexist. If we discern among these images technical instruments exhibited at the Musée des Arts et des Métiers in Paris, which refer to the measure of the infinitely large or the infinitely small, we also observe the surreptitious appearance of scenes reported from anthropological missions at the beginning of the last century. From the outset, we can see that this device of coexistence between text and image, but also between scientific tools and human figures, suggests a history of observation techniques that seek to influence and channel the reign of the living, as if to say that any questioning of the image, in its relation to technique, is also a way of meditating on what compels the destiny of human beings. Contemporary artist living and working in Paris, France. Pablo-Martín Córdoba structures his work against the image conceived as a punctual cut in the domain of time and that of space. Both the latent motion of the still image and the fixity constructed from animated images define a homogeneous universe where the undifferentiated image becomes a plastic material. In this context, and through videos, photomontages and installations, the artists investigates specific aspects of the world by using images. The expansion of the spatio-temporal domain is doubled of a medial questioning which implies a free exploration of digital technologies, its possibilities and its limits. By playing against the devices, the artist seeks forms of plasticity able to speak about reality in a special way, without excluding shifts towards fiction. Images thus conceived, between fixity and movement, between analogue and digital, are subject of transformations that end up investing the materiality of reality. His work has been exhibited in Europe (France, Portugal, Spain, Romania) and America (Argentina, Canada, Colombia). In 2017, he won the first prize in an international photography contest with his series “Rémanences”. His video “L’inter-code” was selected for the international festival Encontros da Imagem 2017 in Portugal, and for Traverse Vidéo 2018.